Come visit! These sculptures and dozens more are touring the U.S. now through 2014. Over 25 larger-than-life sculptures created with nearly half a million LEGO pieces! Read more and come visit! 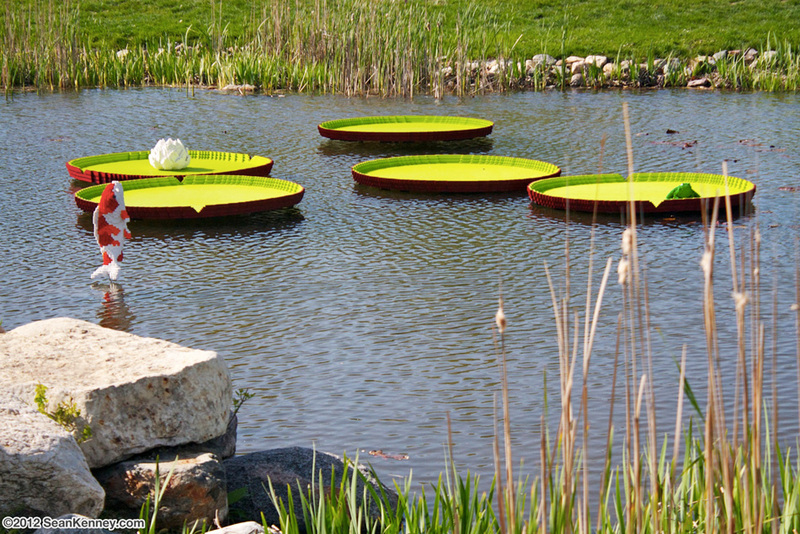 The lily pads are replicas of the Giant Victoria Waterplatter, 5 feet across each -- which as is how large these amazing plants actually grow. Each contains 10,598 LEGO pieces (52,990 total). The sculptures were installed in April 2012 at Reiman Gardens in Iowa as part of my traveling exhibition, Nature Connects. In October 2012 it will travel to it's next location, so stay tuned for updates! Each lily pad took over 60 hours build by my team and I. Each piece is glued one-by-one and a steel armature helps keep the sculpture elevated above water level. They are huge! Eun Nye, Jung Ah, and Ji Yoon build the first lily pad with over 10,000 LEGO pieces.